SNES Front Mission Series: Gun Hazard (JPN) in 2:06:15.37 by Hetfield90. Released for the Super Famicom in 1996, Front Mission Series: Gun Hazard is the second installment of the Front Mission series. 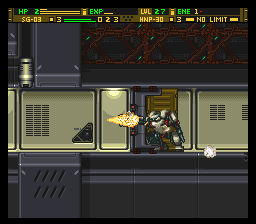 Unlike the numbered titles in the series, which are isometric tactical RPGs, Gun Hazard is a side-scrolling shooter which takes place in a completely separate universe. The game was never given an offical English release, but there is a high quality fan translation made by Aeon Genesis.